Kick-starting global decarbonization only takes a few actors to get the ball rolling. Meeting the Paris Agreement’s long-term temperature limit requires a decarbonization of the global energy system by mid-century. Decarbonizing the power sector is the first step in the comprehensive transformation of the energy system (Rogelj et al. 2015). This requires transformational changes in each sector of the energy system before 2050. 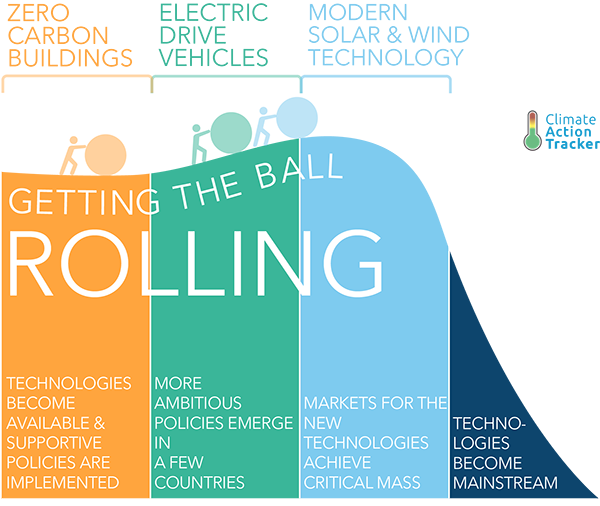 This report looks at the technology trends driving decarbonization in three sectors—power, transportation, and buildings—along with empirical evidence on what can drive these rapid transitions. It identifies success factors that could support transitions in other areas to make the transformation scalable. The stringency of the Paris Agreement’s aim to pursue efforts to limit global temperature increase to 1.5°C places significant additional pressure on the rate of transformation needed in each of these sectors. Technological trends in these three sectors have experienced different levels of change, with the power sector witnessing the most transformation due to the rapid development of renewables that have far exceeded expectations. The accelerated uptake of electric-drive vehicles (EDVs) in the transport sector, if fully scaled, could trigger further transformation for that sector. The building sector, however, has seen limited progress and lags far behind its technological potential. Stages of system change achieved by zero carbon buildings, electric-drive vehicles, and modern solar and wind power technologies. The transformational changes in the power and transport sectors have so far been triggered by policymaking efforts of only a few frontrunners—a small group of countries and regions with the right policy incentives—who have transformed the global market for the technologies and allowed the transition to move beyond the frontrunners to a wider circle. A transformative coalition of countries and sub-national actors in the building sector could accelerate the sector’s decarbonization with approaches that take into account the considerable differences between the building stocks in various regions. Lessons learned from these early-mover countries could enable these kinds of transitions to become mainstream, achieve critical mass—and transform not just the internal markets of countries participating but significantly influence development outside of those markets, eventually allowing for rapid global decarbonization.